The best bicycle tour had a 23 year wait before it began! In 1992 I read the book, Miles From Nowhere, by Barbara Savage, about a couple's bicycle journey around the world which lasted 2 years. I was so inspired that I began planning my own around the world bicycle tour with my boyfriend at the time. After a while he announced that it was my dream and not his and that he wasn't going. I decided that I would still go around the world but not by bike. I traveled solo on a transformational, spiritual journey that lasted a year and a half. This included my 4 week yoga teacher's training course in southern India, a month long course in Buddhism and meditation in a monastery in Nepal, 3 ten day silent meditation retreats in India and Thailand, various Ashrams, scuba diving in the Great Barrier Reef and more. I still wanted to do a bicycle tour but I always thought that it would be too hard to do alone, and that you needed 2 people to split the weight of all of the camping gear. In the spring of 2015 I was talking to my friend Angie, "I don't know what to do for my vacation," I told her. 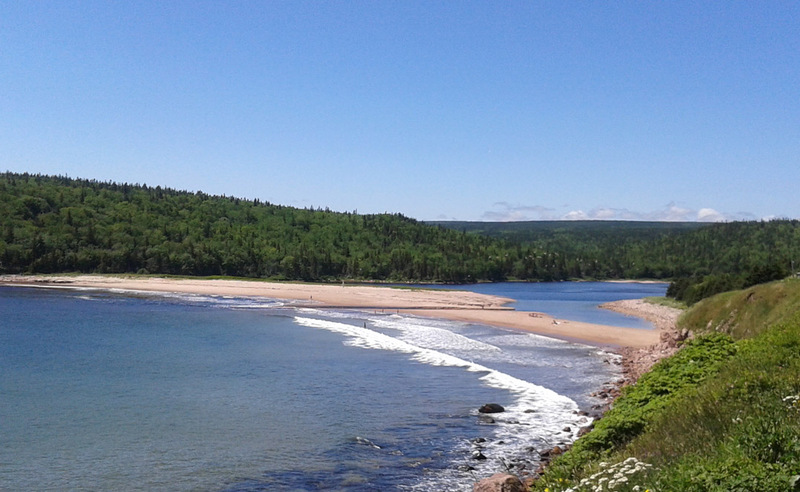 "I'd like to go to the ocean and I've always wanted to see the east coast of Canada." 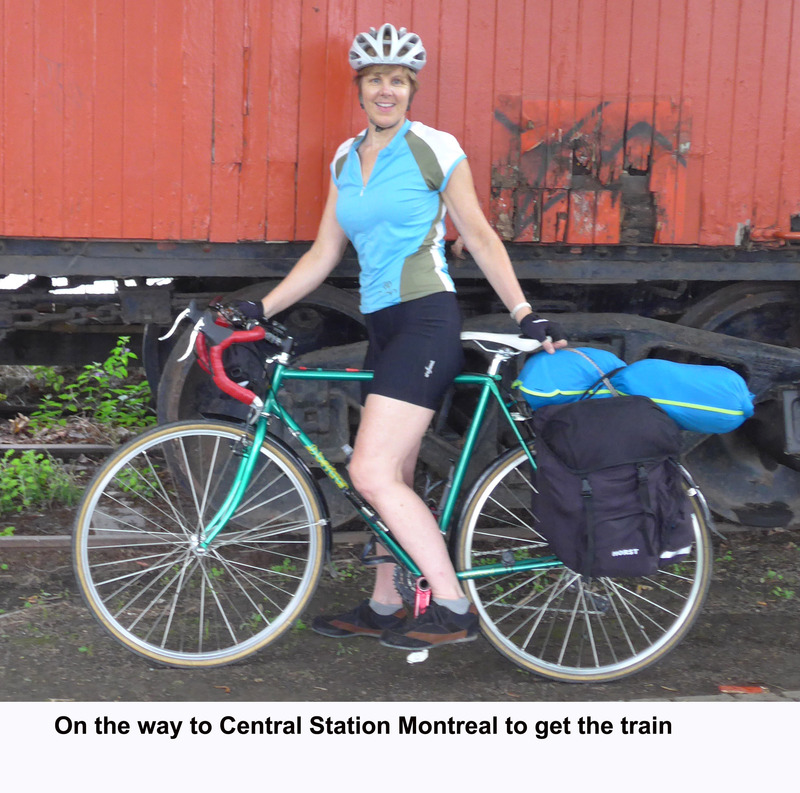 "You can just take the train to Moncton and tour by bicycle," she replied. She has done solo bike touring. Once the idea was planted I couldn't shake it. Yes, I could do this alone. I'm a strong cyclist and I'm in great health. A few days later I booked my ticket and started planing my trip! I decided to call it my Epic Bicycle Adventure. In 2016 I did a solo cycle tour through New Hampshire and Maine. I arrived in Moncton after taking the overnight train from Montreal and I saw 2 cyclists getting their bikes ready to put on a bus. Perfect timing or divine intervention? There would be many wonderful synchronicities throughout my trip. 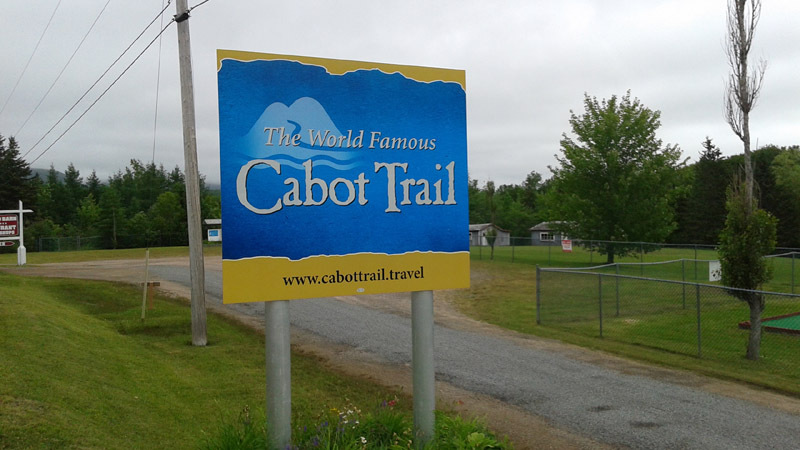 I had no idea that for 5$ it was possible to do that and I decided to take the bus right to Baddeck, the start of the Cabot Trail, the next afternoon. That way I could cover 420 kms in one day, leaving more time to cycle where I really wanted to. I felt immensely grateful to have been there to witness that at the right time! The bus left the following day at 2 PM. I called Claude, who was listed on www.warmshowers.org and apologized for the last minute call, and asked if I could stay at his place. He replied yes and said that he would come into town to pick me up as he lived around 12 kms away. I assured him it wasn’t necessary, but he insisted, so I accepted. He and his family were French Canadian. 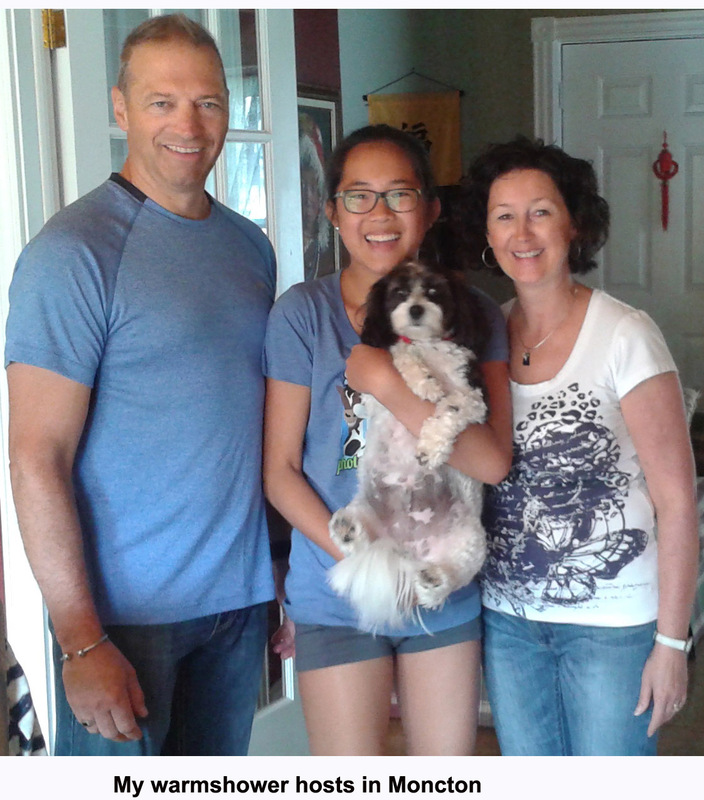 I was happy to be able to speak French to them, although there were many different pronunciations. They were gracious, friendly hosts with a really nice home pictured above, and they fed me dinner and breakfast (which I found out is usually the norm for warmshowers.org hosts) before driving me back to Moncton the next day as it was raining off and on. 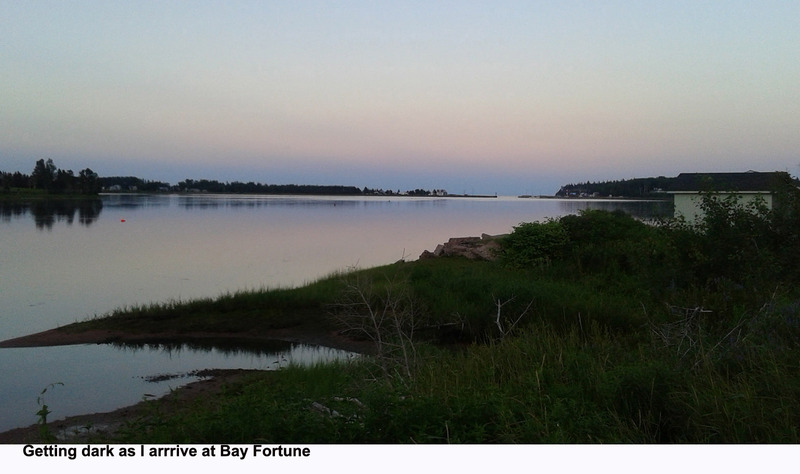 I took the bus to Baddeck and arrived at dusk. Going over the huge hills in Cape Breton I was happy to be on the bus. 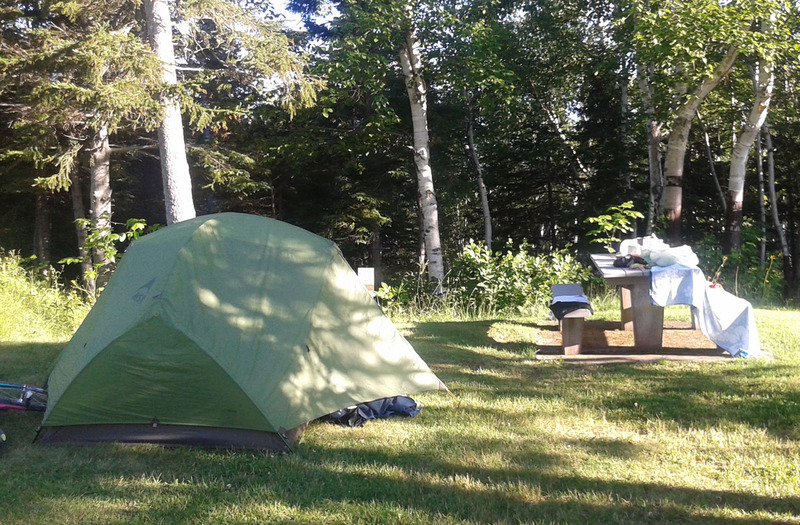 I rode about 3 kms to the Bras D’Or lakes campground. Day 3 of my bicycle tour vacation - I made it! Let the Adventure Begin!! I started out the next day under cloudy skies and sprinkling rain, then steady drizzle. 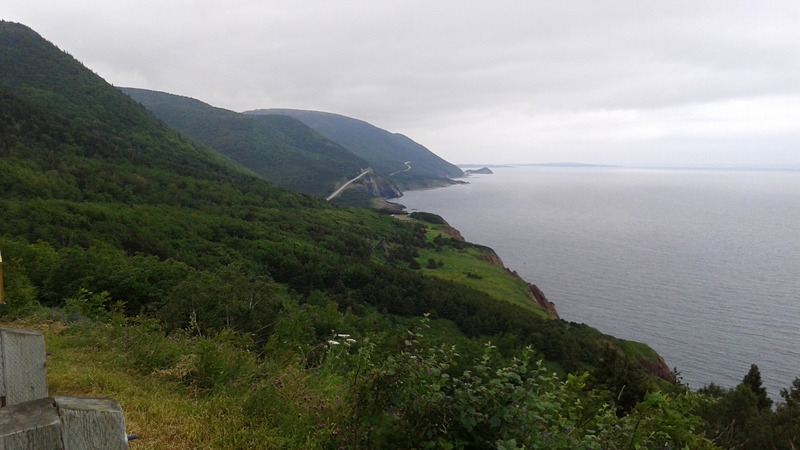 I had finally made it to the Cabot Trail, I was so excited!! I set off straight up a big hill, this wasn't going to be easy I thought to myself! A little before 12 I came upon a bakery called the Dancing Goat. By that time I was kind of cold and my legs were bright red from the rain. I went in and ordered a sweet potato and curry soup with a quiche. It felt so good to warm up with a delicious bowl of soup! 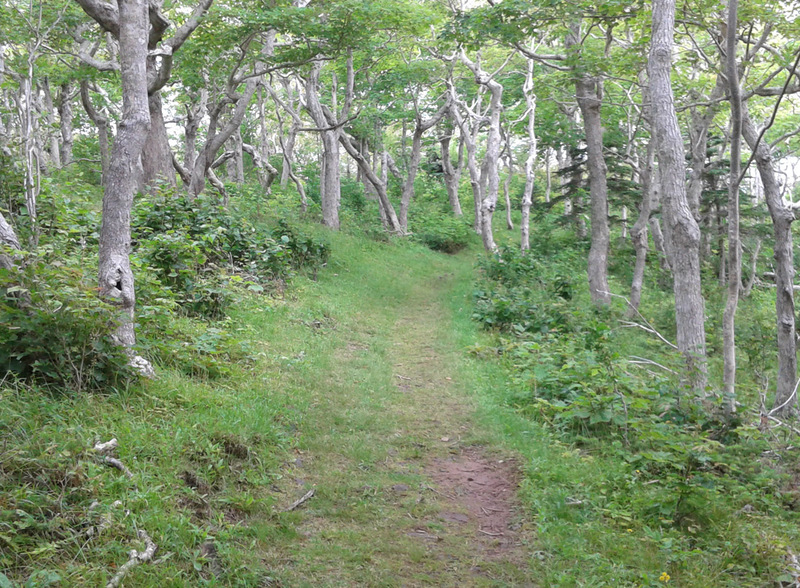 I thought I’d stay in Margaree, either find a place to stay or using Warmshowers.org, however the owner said she would be away, but maybe I could pitch my tent in her backyard. 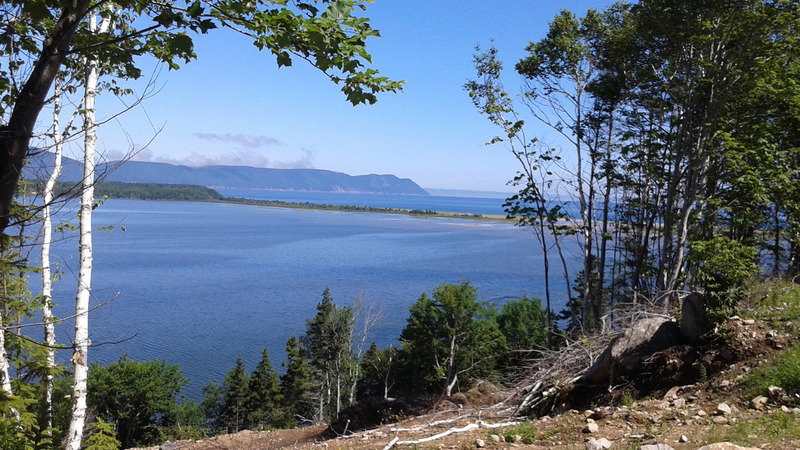 Although the guide books I had read made Margaree sound like an exciting place there was nothing there besides a small general store with only canned goods. Now what? I checked the weather report and it was calling for rain for a few more days. Feeling discouraged and upset with the rainy weather, I texted one of my best friend's, "Rain, rain rain rain , no fun." I wrote. "Darn, I'm having my chemo as I type, wanna switch places?" she replied. Of course this put everything into perspective. I was on vacation in a beautiful place, healthy, and strong, so what if I got a little wet? 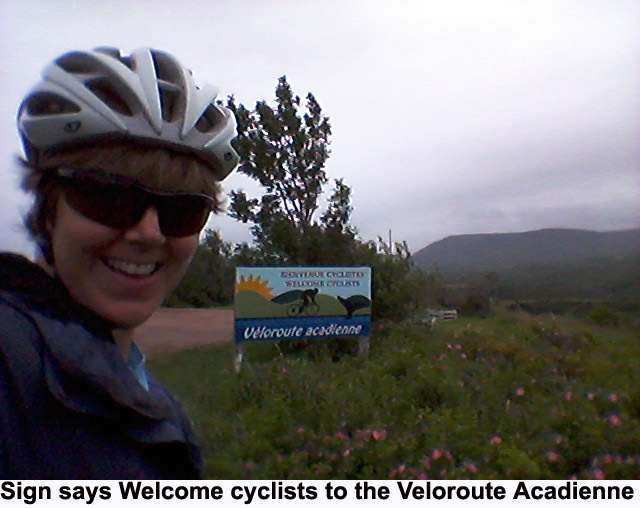 I pushed on to the next Acadian coastal town, Cheticamp, 25 kms (15 miles) away. 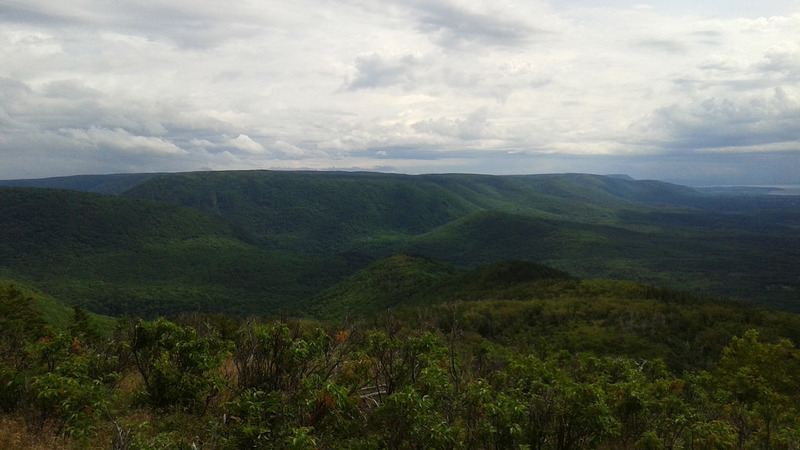 I bought some groceries and I entered the beautiful forests of the Cape Breton Highlands National Park. 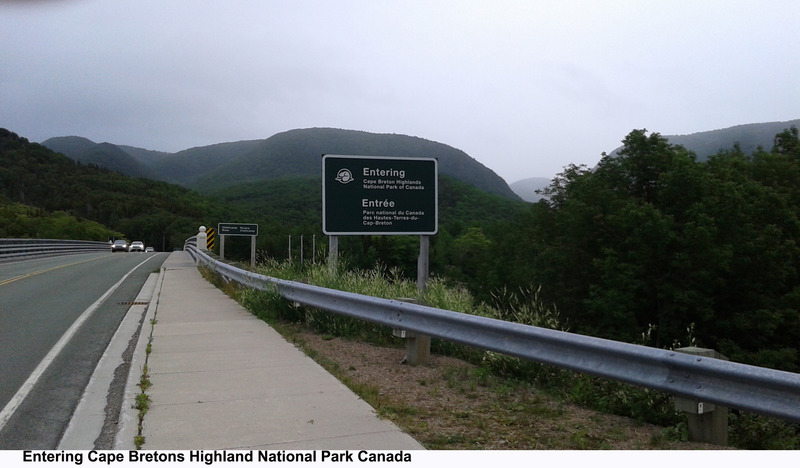 I had traveled about 100 kms (60 miles) over many hills. Although climbing the hills was slow going I felt comfortable going up to 55 kms (34 miles) an hour going down hill. I was so happy that I had no pain in my shoulder and neck as last summer I hadn't been able to cycle all summer, due to disc degeneration in my upper spine causing a pinched nerve down my arm. My supplements, diet and osteopath sessions were working! Yay! The next day I rested and I finally felt completely relaxed and in vacation mode! 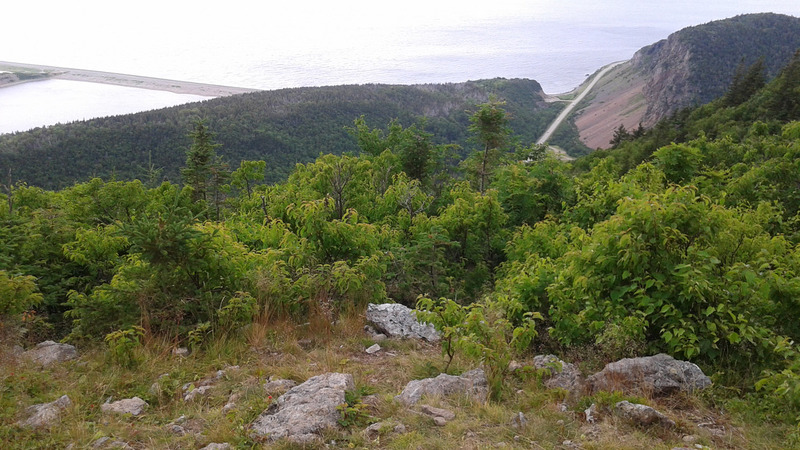 I went for a hike on the beautiful Acadian trail, a 3 to 4 hour climb that afforded beautiful views. It rained late in the day as I was finishing my hike. 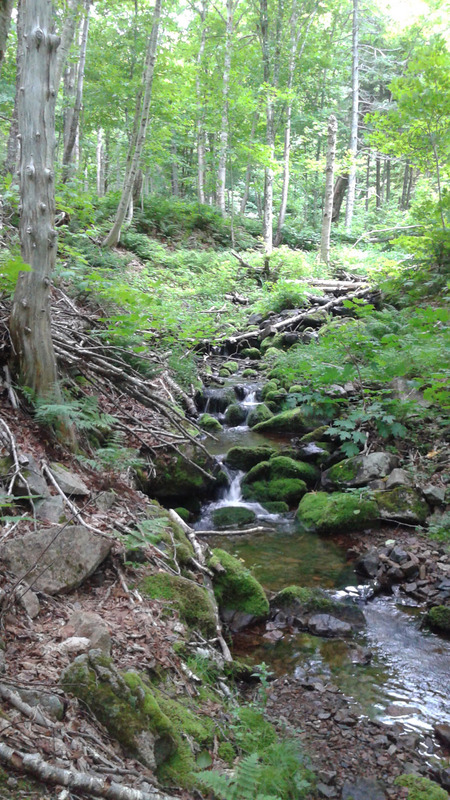 Below are the pics of my hike. 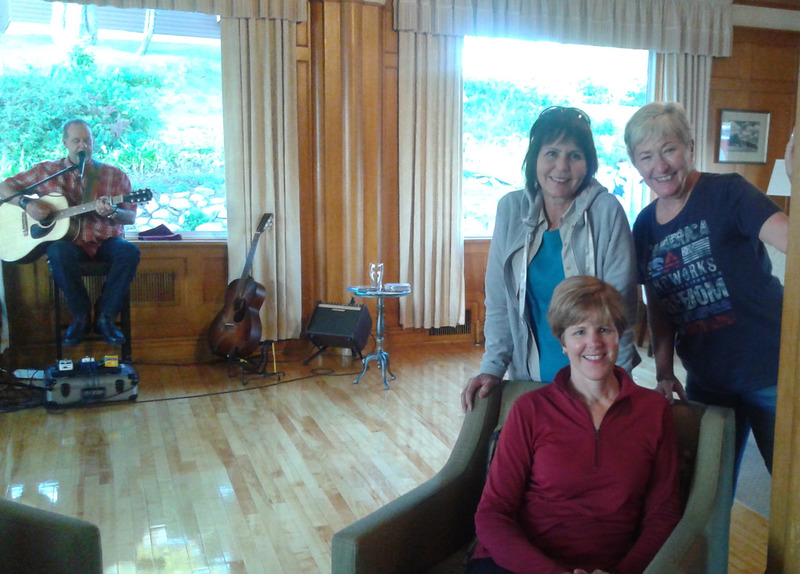 Later I met a few of my fellow campers including Betty and Paula, 2 wonderful women from Virginia and North Carolina traveling by camper van. Day 5 of touring on a bicycle - Climbing 2 mountains and a well deserved drink! The forecast predicted a lot of rain, so I was planning on staying put for another day but when I got up it was sunny. I learned that one can never count on weather reports, especially in the mountains and it's best to just keep on going rain or no rain. I packed up my gear which usually took about an hour, tightly rolling my mattress, using compression sacks to compress clothes, tent and sleeping bag into tight bundles. 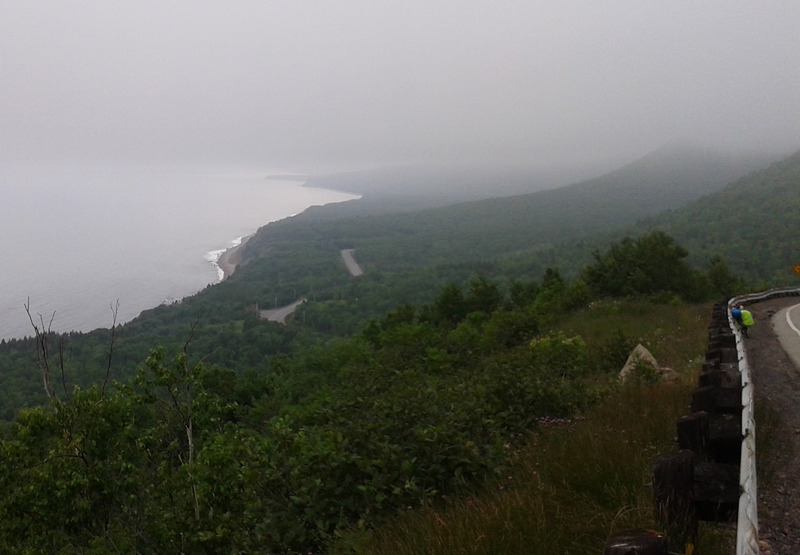 I followed the beautiful hilly roads that hug the coast that the Cabot Trail is famous for. I made it up and over French Mountain with its 11% grade for 6 kms. At one lookout point a woman remarked, "You're better than me!" "Maybe not better, just stronger," I replied, not wanting her to put herself down. "Stronger both physically and mentally," she replied, "I could never do that!" Being a woman alone on a bike allowed me to meet a lot of people. They wanted to know how far I was going and where I had come from. It was great to meet and talk to the locals and other travelers, especially those traveling by bicycle. I met a few couples and single guys but no other single women on bikes. I felt happy and proud when motorists gave me the thumbs up on the trail, and between the people I met and the gorgeous scenery to admire I rarely felt lonely. But of course there were highs and lows of my bicycle tour adventure. 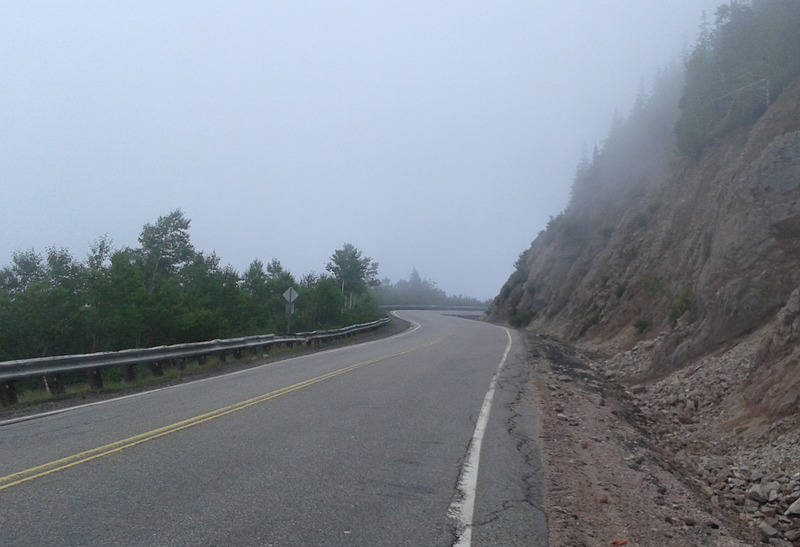 When climbing the very steep North Mountain with 13% grade for 3 kms it started to rain really hard. Twice I decided to get off my bike and push it a few hundred meters as it was so steep. There weren't any views in the clouds fog and rain. I came down the other side holding tight on my wet brakes, stopping every once in a while to rest my aching hands. My hands and feet were cold and wet and I got chilled and was not happy, questioning my idea of cycling for a vacation and thinking that when I got home, I would never bike again! 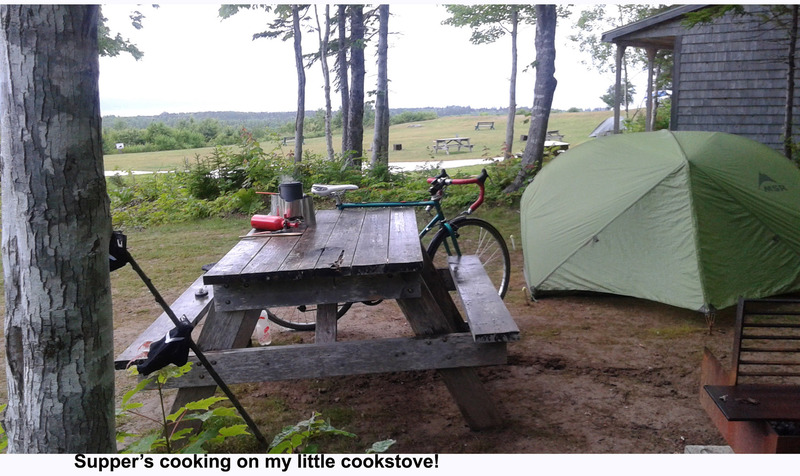 At Hideaway Campground outside Dingwall, it stopped raining before I set up my tent, had a hot shower and cooked dinner on my little camp-stove. 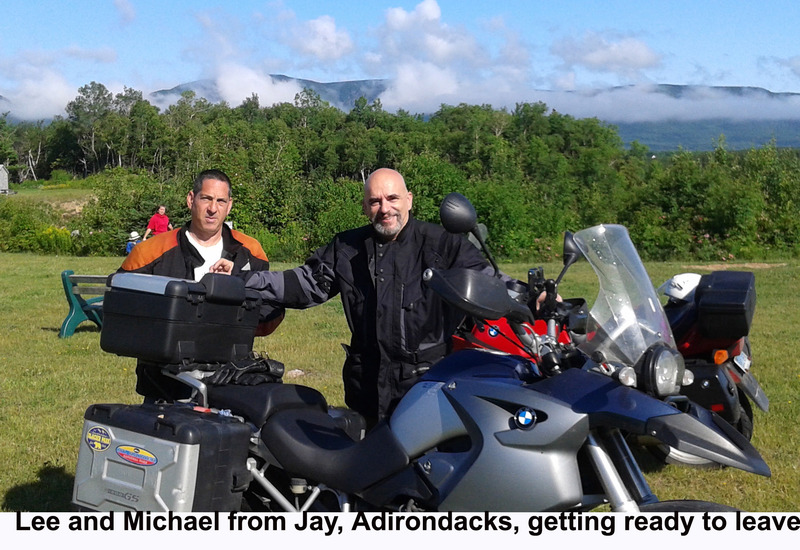 After dinner I joined 2 guys from The Adirondacks, traveling by motorcycle inside in the campground common area that had wifi. They offered me a drink of vodka and juice. Yes!! After the day I had, I could use a drink, it was great to share stories and laughs with them after a challenging day. I had brought along 2 rather heavy novels to read, but what I learned was, that between setting up camp and taking it down, packing up, added to a full day of cycling, buying and cooking food and socializing, I did very little reading and days would go by where I didn’t even written in my journal. Day 6 bicycle touring pictures: The perfect day! I awoke to a gorgeous, sunny day! I was so happy, finally! I said goodbye to Lee and Michael and I followed the White Point road which got me off the main road along the northern coastal cliffs which afforded stunning views all day! I was high on the perfect weather, newly paved road, drunk on the scenery and on my bike I could stop anywhere to take pictures, which I did. 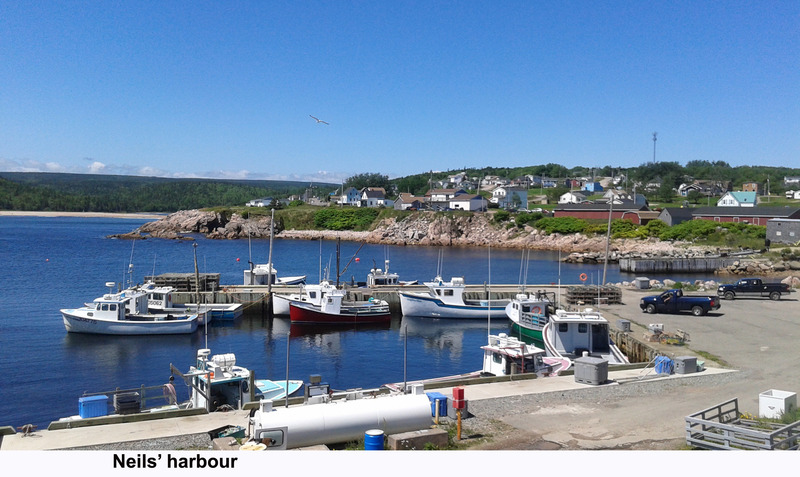 At Neil’s Harbour and decided to go get a close up of the lighthouse and came upon a packed restaurant, The Chowder House, I enjoyed a delicious bowl of seafood chowder outside at a picnic table, again, chatting with others about my journey. 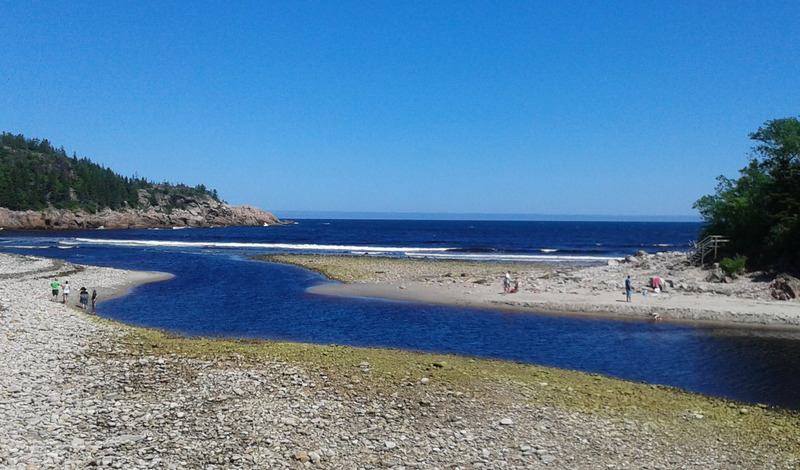 I arrived at the quiet Ingonish Beach campground at 4, time enough to quickly set up my tent and go down to the beach, a 5 minute walk through the woods to get there! It was so amazing to finally be at the ocean and enjoy wading in the waves. Lee had suggested I have a tea at the rather ritzy Keltic Lodge which would afford me magnificent views of the ocean on both sides of the point. I decided I wouldn’t have time the following day so I’d go for a glass of wine instead. 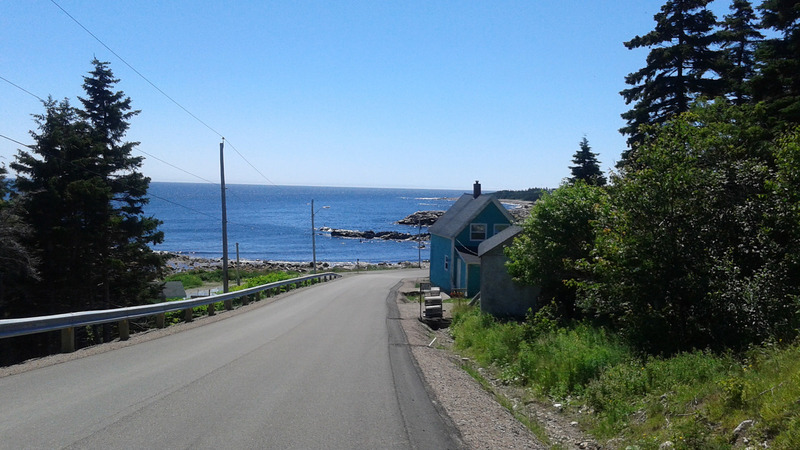 I rode my bike a few kms down the road and went into the bar where there was a musician singing Scottish and popular songs like "Farewell to Nova Scotia." While sitting at the bar I noticed Paula and Betty and was so happy to join them, it was a fun evening, the end to an absolutely perfect day! I fall asleep in my tent, lulled by the sound of the ocean! I awoke to more light showers and some camping neighbors (from Laval, north of Montreal) invited me for a pancake breakfast! It was 11 when I got on the road, no rain for now. 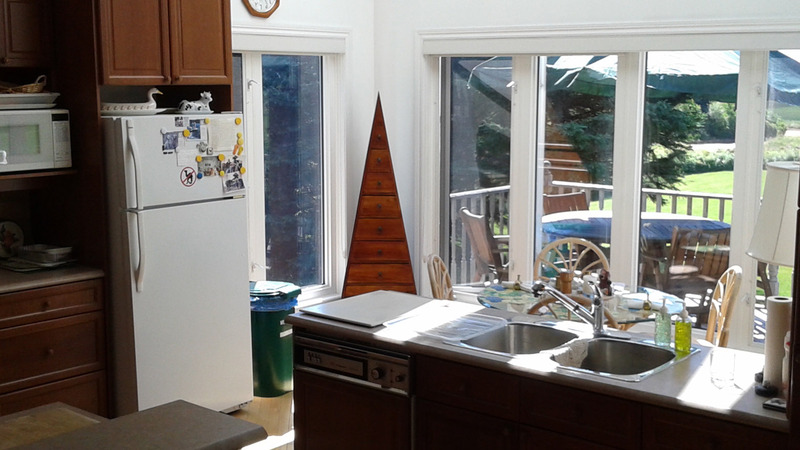 My neighbors had told me that there weren’t really any towns between where I was leaving and Baddeck. I slowly climbed Old Smokey which I had been warned was a difficult mountain to go over but I found it wasn’t too bad as it was a gradual climb. I went into clouds and through fog. 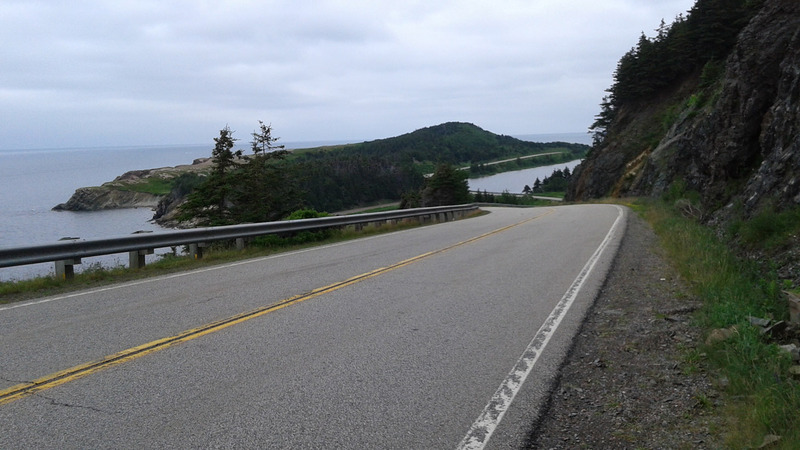 The descent was extremely steep and I felt so grateful that I was doing the Cabot Trail clockwise, as coming up the other side would’ve been brutal. It started raining again in the afternoon and I decided to keep on going as far as I could that day. There was a strong head wind all the way so I was working hard. I was going to stop at a café but decided to just keep pedaling. I was tired. Sleeping in campgrounds on my little narrow mat, sometimes had me waking almost every time I turned over, there could be people making noise, early sunlight and birds that start singing very early! The short ferry to Englishtown was free for bikes! Then I was on a busy 4 lane highway. While there was a wide shoulder it was unnerving to have cars and trucks go by at over 100 kms an hour. 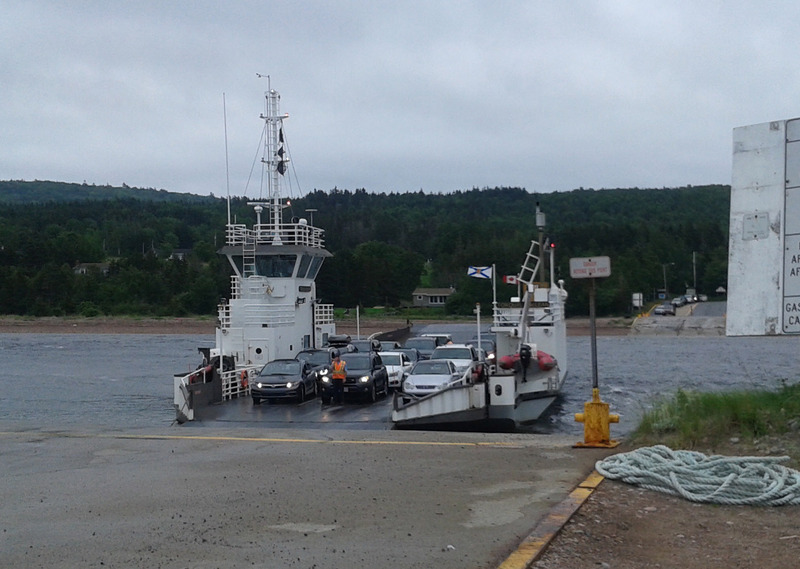 I finally pulled into Baddeck at 6:30 PM. If I could find out about buses I could leave Baddeck the next day. At the Tourist Information it took quite a long time but they finally determined that buying my ticket online would ensure the bus would stop. They allowed me to use their computer and printer to purchase and print my ticket and then promptly closed their doors, just before 7. Yes! 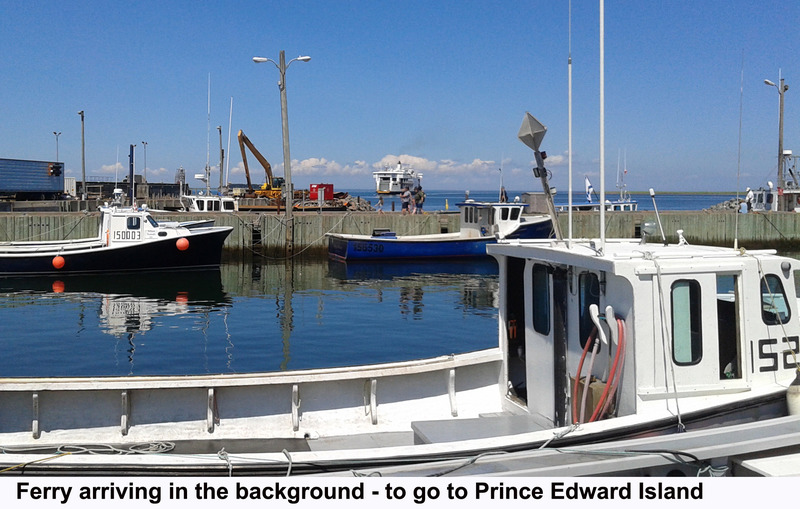 If I hadn’t pushed all day and had arrived a little later I would’ve been stuck in Baddeck another day as the bus left at 9:30 AM. I also found out that it was a long holiday weekend, August 1st. Quebec doesn’t have the same holiday, so I didn’t realize this. Cars and people were pouring onto the Cabot Trial and into the campgrounds, I managed to get one of the last campsites and I would be leaving just in time to get away from the hordes of traffic and people! Perfect! 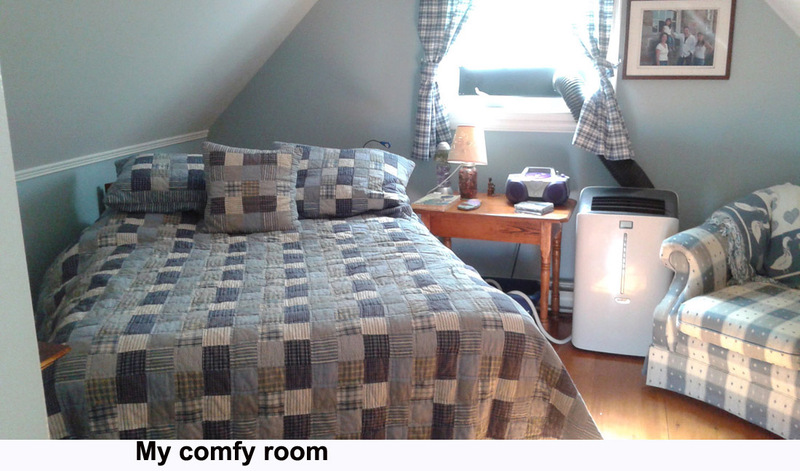 Day 8 of my adventure bicycle tour - Onto PEI and luxurious accommodations! After a nearly sleepless night in a noisy, packed, campground with people partying, young children screaming in the middle of the night and people up early, I rode a few kms and grabbed the last yogurt and granola cup at Tim Hortons before getting on the bus. A beautiful sunny day! I arrived in New Glascow at 12:20 and biked 30 kms to the ferry. I caught the ferry at 2:45 it was also free for bikes! I was so excited to be arriving in PEI! After 75 minutes we docked within view of a lighthouse. 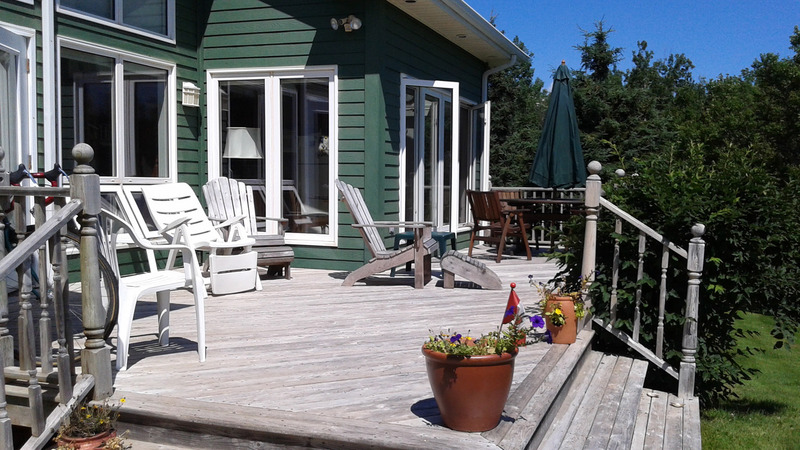 While talking to my sister a few days earlier she told me that her friend Maureen had a cottage in Bay Fortune and I could stay there as she wasn’t using it. 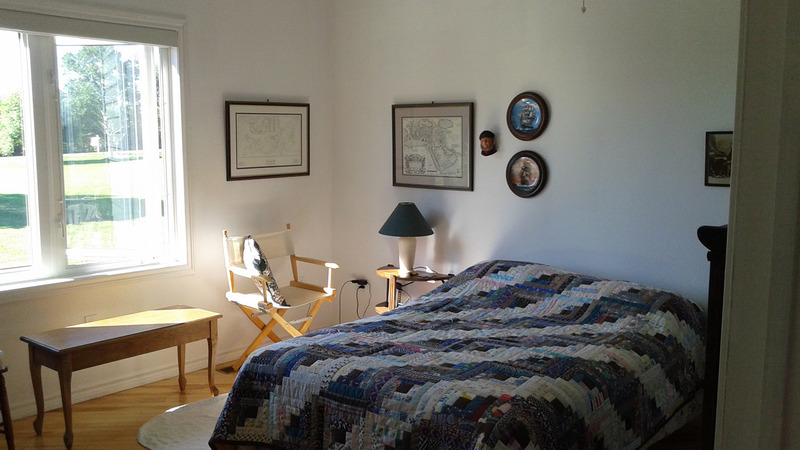 I was really looking forward to staying in a house with a bed and all the comforts of home! I was determined to make it there. Her brother in law Paul, and his wife Marion, would let me in. 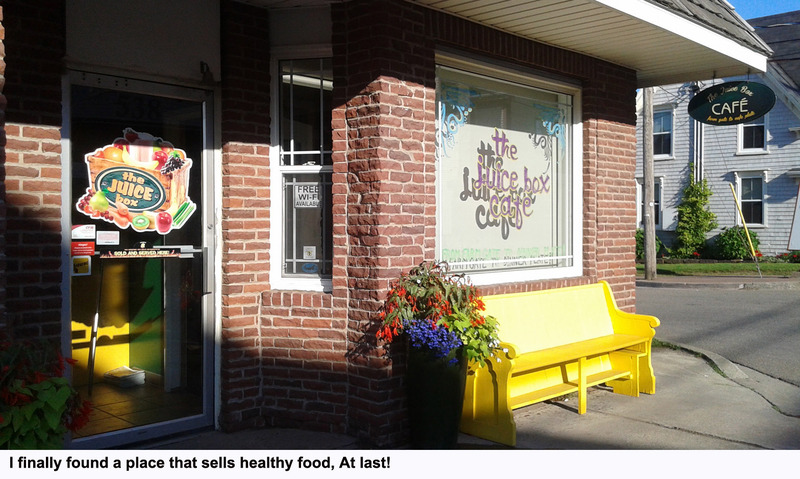 At around 6 I came into Montague and to The Juice Bar Café, finally some healthy food! I had a thirst quenching fruit smoothie and a wrap filled with chicken and loads of vegetables and sprouts. 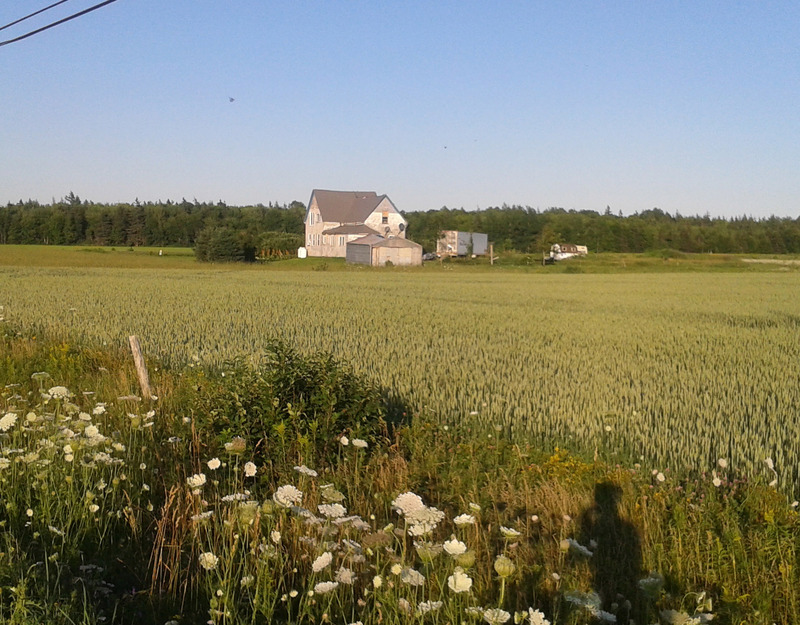 PEI was not flat, there were very big rolling hills. And going up them was slow with my heavy load and my fatigue. 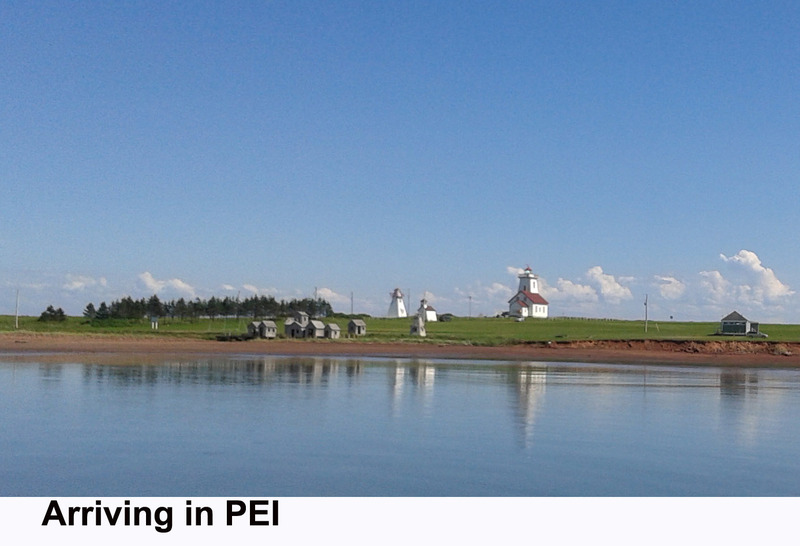 I also found out that distances in PEI might not look far but they are! I came to a dirt road and then finally back on to pavement. It was getting dark. I figured I must be close when I got to an intersection and asked a woman in a car that pulled up, if she knew where Cove Road was. 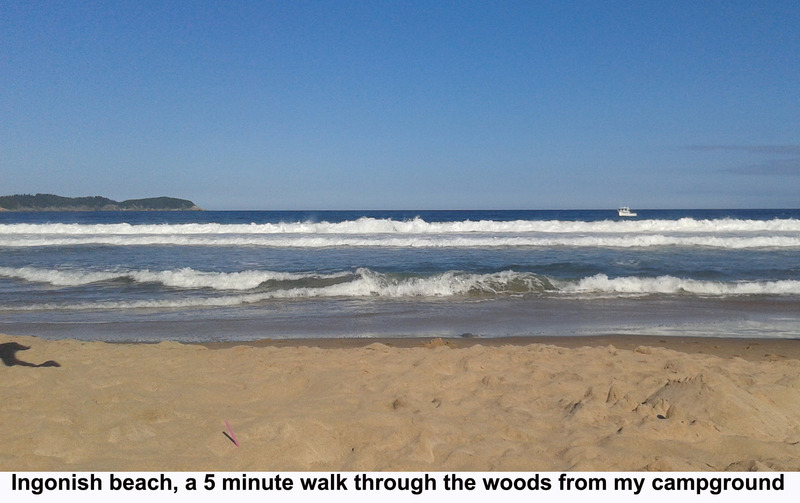 She replied that it was 3 kms away. “I can’t go 3 more kms," I moaned! I was hoping it was around the corner, she looked at me surprised and I told her it was ok. I could do this. I pulled into Marion and Paul’s at 8:45 PM. It was almost dark. Marion kindly offered to give me some food for breakfast as the stores were 15 kms away and it was Sunday the next day so they wouldn’t open until 12. I accepted, how nice! She made me a lovely package with bread, cheese, her home made jam and some yogurt. She also offered to drive me into Souris, the next day. I said I could ride the 15 kms, but she said she would be happy to drive me. 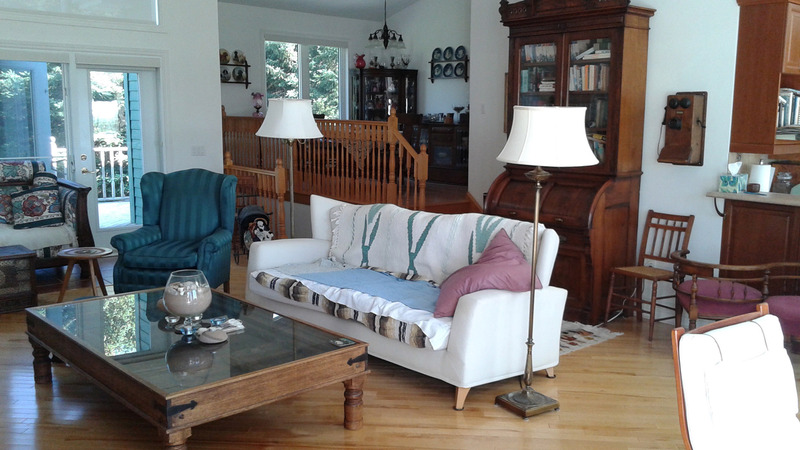 When I walked into the house I couldn’t believe it. It was Stunning! 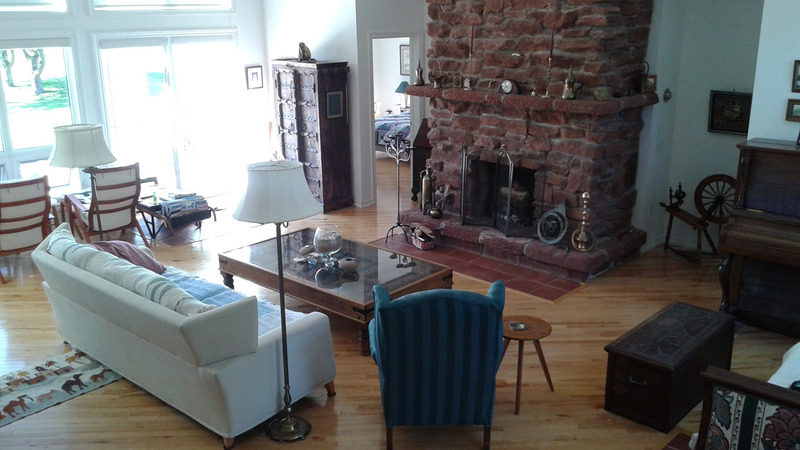 Antiques, beautiful furniture, lovely big windows a view of the ocean, huge deck front and back, wow!! I fell into a deep sleep in a nice comfortable bed, ahhh! Follow the 2nd week of my Adventure Bicycle tour here!